The museum is closed on Christmas Day and King’s Day (April 27th). Opening and closing times will vary on Christmas Eve, New Year’s Eve and New Year’s Day. We recommend visiting before 11.00 or after 15.00. 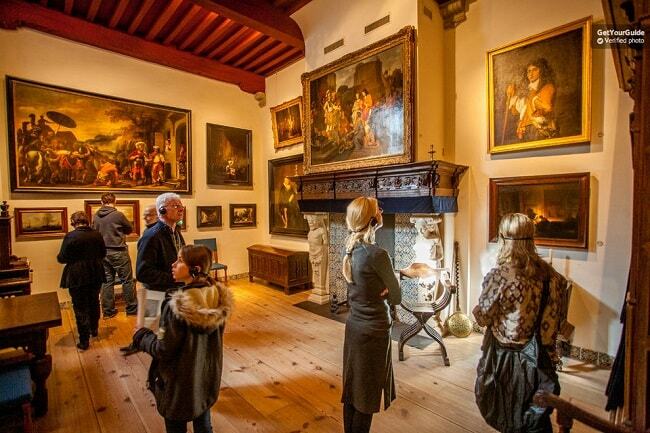 We are comparing Rembrandt House Museum Ticket Skip Line Prices from leading ticket suppliers and Try to find you Cheap tickets prices on the market. The former home of revered 17th-century artist, Rembrandt, welcomes you inside. Filled with narrow spiral staircases, historic ornaments and original furniture, the Rembrandt House Museum will send you on a journey to the mid-1600’s. For 20 years Rembrandt lived within the walls of this very house. His creative mind inspired by what he saw whilst gazing down at Amsterdam life from the window. Many of the Dutch Master’s finest works were brought to life in this very same building and the museum still hosts a selection of the artists’ works and etchings. In 1656 the bankrupt artist was evicted from his home. Fortunately, many of his possessions have been located and are on display inside the museum. Anything from military helms to seashell collections to brass busts and drawing equipment. You’ll also the works artists inspired by Rembrandt in temporary exhibitions. A multilingual audio guide will teach you about the artist's life, family and works, while the museum staff will guide you through complimentary workshops. If you’re looking for a quirky and interesting museum then the Rembrandt House is the best place all of Amsterdam. Here you can explore the original quarters of the great artist so the museum will defiantly appeal to art and history lovers. Great for children too as they can get involved in etching workshops. The skip the line entrance ticket is ideal for anyone with limited time in the city. Your Experience With Rembrandt House Museum Ticket Skip Line ? Discover one of Amsterdam’s most unique museums. Loose yourself in the great artists former home. Take a look at collections of Rembrandts original etchings and pieces of art by modern artists who have followed in his footprints. Learn about the life of the famous 17th century artists with a multilingual audio guide. Test your skills and learn new ones in free etchings workshop inside the Rembrandt House Museum. Don’t waste your holiday waiting in line, instead use your fast track entrance ticket to skip the entrance line. What Rembrandt House Museum Ticket Skip Line Includes? Admission fee for one person per ticket. Fast track entrance to the Rembrandt House Museum. Complimentary audio guide, available in: English, Dutch, German, French, Spanish, Italian, and Russian. Free Museum Booklet, available in: English, Dutch, German, and Russian. Entrance to this museum is included in the I Amsterdam City Pass, if you plan to visit other top museums in the city then you should consider purchasing the pass. Travelers Reviews about Rembrandt House Museum Ticket Skip Line ? This Dutch museum has an impressive 4.5 out of 5-star rating from over 5,000 trip advisor users who have visited the historic attraction. The Museum is also highly recommended by visitors who purchased their tickets with Get Your Guide and Tiqets. The skip the line entrance ticket has a 4.7-star rating on Get Your Guide and a 4.5-star rating on Tiqets. Overall visitors agree that this is a wonderful attraction however some comments point out that parts of the building are not wheelchair accessible. Exhibits in the new wing of the Rembrandt Museum are accessible by elevator. Parts of the museum are not suitable for disabled visitors due to narrow staircases. There is no disabled parking on site. Full refunds are available for tickets purchased via Get Your Guide or Tiqets up to 24 hours in advance. Cancellations should be made with viator at least 7 days in advance for a full refund and at least 2 days in advance for a partial refund. Confirmation of ticket purchase will be sent via email. Discounts are available for disabled visitors and children aged 6 to 17. Children under 6 enter for free. Meeting Point: The main entrance to The Rembrandt House Museum, Jodenbreestraat 4, Amsterdam.